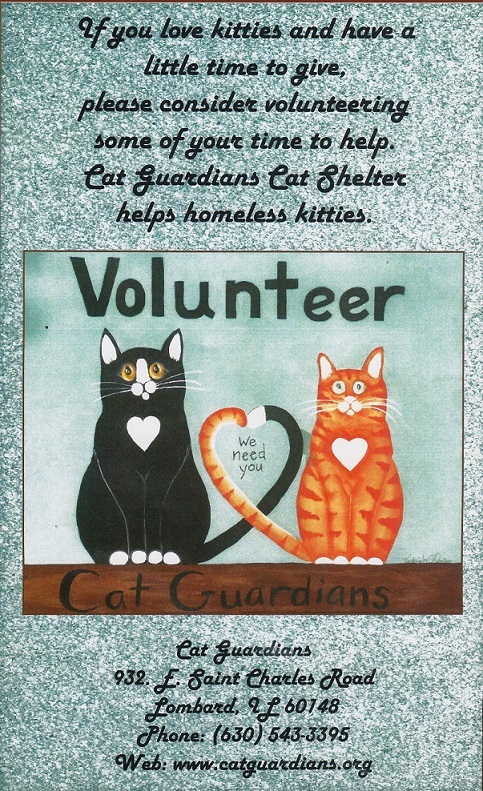 If you are 18 years or older and want to make a difference, please sign-up online or print out a form and mail it to Cat Guardians, 932 E. St. Charles Road, Lombard, IL 60148. Better yet, stop by the shelter during our open hours: 11-3 Saturdays and Sundays, and 4-8 on Tuesdays to chat with current volunteers and see first-hand how rewarding the experience can be. Volunteers make our success possible by helping in and around our shelter, visiting pet stores, fund-raising and various other skills. The 2nd Tuesday of each month is our Volunteer Orientation Training. You may wish to drop off your form at this time and learn about the shelter’s daily operations, and how you can help out.